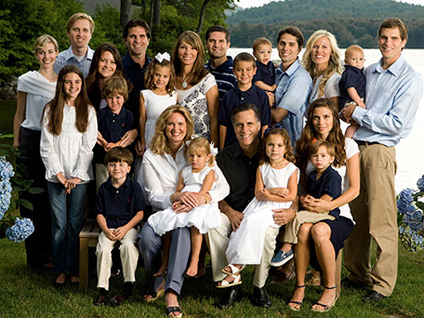 White House hopeful Mitt Romney wants to make room for his extended family at his Spanish villa overlooking the Pacific Ocean. Romney has filed for permits for work that would almost quadruple the size of 3,009 square foot three-bedroom single-story home in tony La Jolla, California, near San Diego, to make way for a mansion. The plans call for a total demolition of the existing $12 million home and building a two-story, 11,062 square foot house in its stead, the San Diego Union Tribune reports. Romney campaign spokeswoman Andrea Saul did not immediately respond to a request for comment, but the campaign told Politico that the new house is designed to be large enough for his five married sons and 16 grandchildren, though construction will not begin until "the campaign is finished." If Romney wins the Republican nomination, that would be November 2012. And if he wins the presidency, the home could serve as a third "Western White House" in California. Ronald Reagan and Richard Nixon each had California homes that served as a second residence while they were living at 1600 Pennsylvania Avenue. Republican Arizona Sen. John McCain in 2008 found himself in political hot water after he conceded to an interviewer that he did not know precisely how many homes he and his wife Cindy owned. Democratic nominee and Massachusetts Sen. John Kerry was criticized in 2004 for the many homes owned by his wife, Teresa Heinz Kerry. After dropping out of the 2008 race for the White House, Romney streamlined his real estate portfolio, selling a 9,500 square foot place near a Utah ski resort and offloading the 6,500 square foot home where he raised his five children in Massachusetts. The former Bain Capital executive, said to be worth more than $250 million, still has a vacation spot in New Hampshire and a townhouse in Boston.